There were forms. Moving. A peachy blob picked me up and embraced me. I pricked my ears up because the form started to talk..
"Oh! It's a Minun!" It said in a high, sweet voice. Then the air was pushed out of me. I had to complain. Clary placed me on a hard surface and then kneeled down to my eye level. "Hi, Minun! I'm Clary, a human. And I'm you're trainer!" she said. Trainer?? Huh? Human? Okay this is weird. My mind was blank. I decided to ask, since I was confuzed.. "Mii??" What's a trainer? I'm confuzed? "Fiesty, that one is." Said that other voice. Clary nodded. "Okay, so I'll explain to you. Since you're just a new born, I guess you don't know anything about... anything." "You see, you're what we call a pokemon, short for pocket monster. It means you have this thing called a pokeball that you rest in and stuff, and I stick you in my pocket.." I stared at Clary with wide eyes. She looked startled. "Oh, but I hear it's very roomy in there, there's nothing to worry about." "Anyways. 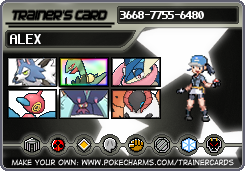 I'm a trainer. And throughout your life, I'm going to train you and teach you stuff. You can battle other pokemon and we can earn ribbons... the fun is endless!" She hugged me tight. "And our adventure is just beggining!" "Nuuuu.." Shiz, that hurts! Go shout in someone else's ear! "Inuu..." Yeah, Okay. I noticed that form the first time I saw you. Clary pulled a red and white thing from her pocket. A pokeball, I guess, because it was a ball.. and it had the same colours as the pokecentre. But once I veiwed the thing, I took a run for it. "III!!!" I don't care how roomy you think that is. It looks EXTREEMLY small and uncomfortable to me! Clary frowned. "If you want to travel with me, you'll have to go in the pokeball, Minun. It's the easiest way to travel for you...." I was already shaking my head. Clary huffed. I walked away from her, and I felt a funny electric current go through me. Clary was running after me. I could feel her steps through the earth. "And it really is roomy. You could probably fit you and a bed and everything a room should have in it!" "Minn...?" Are you serious? Have you even been in the thing? I turned around and stared Clary right in the face. Her cheecks flushed red and my face felt hot. I was so angry. "Mii, nun mi. Mi iinun, Mi." You can't expect me to actually go around in that thing. (I pinched my nose and huffed in her face) It probably stinks too. Who do you think you are, huh? It was true. I really don't know about this adventure thing. Clary was already annoying me. I don't want to go in a pokeball, doesn't she get it? Clary sat cross legged and crossed her arms too. then she sighed and frowned. But then she seemed to have though it all over, and maybe, counted to ten. Because she lossened up and smiled. "Fine. You don't have to go in the pokeball." She stood up and walked in the direction of a path in a forest. "But don't complain to me when you want to relax, because I don't give free rides..." She patted her back, and kept walking. I skipped and jumped. It felt good to be.. alive. Born, I guess. And Clary hasn't been bothering me... so that kindof made life more enjoyable. The forest path twisted and turned, and we kept on walking. I figure she knows the way, so she's in the lead, and I'm following, of course. So I decided it's been a bit too long. She's annoying, but I can't handle silence. "Mii" It's really nice that you've been ignoring me. I appreciate it. Then the Satrly noticed us, and it suddenly became defensive. Clary shot me a look and pointed. "Okay, Minun. We need to attack!" The Starly was gaining on us. What does it have against us anyways? "Mii..?" What, why? How..? Clary fumbled with her red thing. "Um..." she pointed it in my direction and I flinched. "Niiuuu!!" What are you doing? what is that thing? I stumbled back. The Starly came closer. Tackle? okay. I can do that too. I jumped up and threw myself on the Starly. I did it pretty quickly too, and then it fell on its side. Clary read the red thing again. "Quick attack? Wow. You learn fast." "Wow" Clary said. Why is she stunned so? I looked up at her and shrugged. "Mii" We should probably go. Before its parents come and... well, I won't be able to take them on, that's for sure.. I didn't complain about walking on foot. I was tired, though. She just didn't know. Battling other pokemon.. it's kindof tiring. We walked into the city.. and were instantly confronted by a man in a suit. He grabbed Clarys arm and stared at her wrist. I was shocked at his suddeness. My fur was pricky and my ears stood straight up. I started sparking up. And I stared at the man. What if he hurts her? But Clary can take care of herself. Despite what I think. She snatched back he hand and stred menacingly at the man. "Leave my hand alone!" She said to him. He looked stunned fr a second, but then he smiled and stood straight. "I'm so sorry. But I had to check" he said, friendly. Clary stared at him. "FOR WHAT?" The man sighed. "Well, it has come to my attention that you have no poketch!" he eclaimed. I fell tot he floor. A poketch? what is that? Clary relaxed. "Oh. I've heard of those.." The man reached out again. She stared him down. "But you didn't need to grab my wrist like that!" He drew his hand back. "Oh, good. Sorry. Well, if your interested, I'll give you one for free. It comes in handy for a traveler.."
He smiled. "Well, all you have to do is find three clowns, and answer their questions correctly. Then you may have the poketch"
Clary stared at me as if asking my approval. When does she ever do that? I shook my head. I dont trust this guy. He's creepy..
Clary seemed to ignore what I thought though. She said "Thank you" then walked away. "Come on Minun." Huh? Okay... I followed her. Then Clary broke into a run. And I had to run EXTRA fast to catch up. Please Comment! Oh yeah, and it takes place in the sinnoh games/ wise XD obviously! "Mii?" Why did we run, again? Clary looked down at me, still panting. "Sorry about that. " She shuddered. "I hate clowns. If there are ANY in that city.. I wanted to leave.."
Clary started to walk it off. And I followed. We were just on the outskirts of the city. It's bright lights lit the now night sky. The crickets sounded as we trotted through the undergrowth outside Jubilife. Clary yawned and I stared at my feet. I heard her talk then. "We should get soem sleep, Minun. It's getting late.." She reached in a bag ,one of which I have never noticed, and pulled out a large sack. She looked at my confused face. "A sleeping bag." she said. And she opened it up. I shook my head "Mii" Not here.. we're too out in the open. Clary followed me and set down her sleeping bag there. Then she opened it up and climbed inside. I went to the bottom of the bag and sat there, looking out at the city. "Minun" she said suddenly, "I have your pokeball.. if your interested in .. sleeping in it." She reached into her bag again and pulled out my pokeball. "I know you may not like it. Or... you maynot want to try, but.. I just want to let you know that it's there.." She lay down and looked at me. As if expecting an answer. I stred past her at the pokeball. Its round and small shape wasn't appealing. Not even now, that it was cold outside. "Nuu..." I .. I don't think I want to go in it... still..
Clary nodded sleepily. She turned her head away from me. And curled up in the sleeping bag. "Goodnight then, Minun." she said. I watched her for a while, as she fell asleep. Now that she wasn't talking, I seemed easier to be around her. I felt chilled after a while. The nioght air was cool.. and the darkness kindof creeped me out. I guess, since she's asleep.. I crawled to where the opening of the sleeping bag was and i suddenly felt warmer. I found a nook to sleep in beside Clary, and then I lay down and curled into a ball of my own. I woke the next morning to sizeling... and a nice smell.. I opened my eyes and Clary wasn't beside me anymore. The light form the morning sun stung my eyelids. I looked around in panic, but then i saw her. Clary was in the clearing sitting on a tree stump. And there was a guy beside her, keeping a fire going. There was something he held on top of the fire. It was from it that the good smell was coming from. I carefully got up and crawled toward them. "Mii?" Morning.. And who's he? Clary jumped off her stump and glared at me. I shivered. "Oh god, Minun. You scared me!" She turned back to the guy and he looked at me. Then at Clary. "Is This you're pokemon, Sis?" He said. Clary nodded. "This is Minun." She turned to me. "Minun, this is my brother, Kyle. He's been a triner for longer than me, because he's older than me. But he was in the area. He saw us while we were sleeping and decided to stay for breakfast." I nodded. Understanding only half of what she said. Kyle's hand went to his belt and he pulled out three pokeballs. Clary watched her brother. He smiled. "I bet my pokemon are hungry too." And he threw his pokeballs intothe air and three shapes landed beside Minun. Clary opened her red thing (I learned was a pokedex) and scanned it across her brothers pokemon. "Larvitar, Vulpix, and Eevee" she said. "Yupp" Kyle smiled at his pokemon. Clary and Kyle then emersed themselves in conversation. I took to aquanting with his pokemon. The Larvitar looked at me with cold eyes. I shivered again. I hate that! The Vulpix was a female. You cold tell by her soft voice and kind personality. She was nice to me. We could EASILY become friends. I nodded. I looked at the Eevee. First, it ad come across as shy. But I realized I was wrong to think that. That Eevee was a trouble maker. She was no where in sight. But when I looked harder, I could see she was hiding behind Kyle with a smirk.. one that doesn't belong to the innocent. The Eevee grabbed a stick from the ground and lifted it up. It was too late for me to stop her. She was already tilting the pan of food. Hot, sizeling food. Kyle's Eevee had tipped the hot pan of food ALL over. Herself, and on the ground. I shook my head. "Mii.." Nice going! The Eevee looked back at me, and smiled sheepishly. Kyle and Clary jumped up from their seat on the forest floor and Clary screeched as a peice of hot food fell on her leg. Kyle said something harsh under his breath, then he dug in his bag for a wet rag. He gave it to his sister, and she lay it on her leg. Clary suckked in a breath as the burn stung her skin, but the looked wildly from me and Eevee to Kyle. "Thats some colourful language.. " she said, then she leaned into him, "I dont think you should use it in front of the young-uns," she whispered. Eevee's eyes popped wide, and i tilted my head to one side in confusion. Clary smiled with some effort, then heaved herself from the ground, keeping hte rag on her leg. Kyle got to working on cleaning up the spilt food, and hten his Vulpix went to help him. "Thanks, Vul." She smiled. "Pixx" Anytime, my friend. "Mii, mi nu mi" You shouldn't of done that! Now, your master and my friend wont have anything to eat! And you burnt her leg too, when you spilt the food! Do you have to make so much trouble? Because we'd be better off without it! Eevee stared up at me with googlie eyes, and then started to weep. I didn't see it coming when it ran into the forest. For such a small guy, it sure is FAST. Clary turned to me when she saw me at the forests edge, staring in like i had nothing better to do. "Oh no, Minun, what did you do?" If there where Bibas And Spindas This Would be heaven! I glared at Clary. "Mii!" It wasn't MY fault! He's the one who spilled our food! Clary ignored me, apparently, and ran into the forest. Kyle ran in after her. Vulpix followed. I stared at the place where they had disappeared. Hmph. I looked around the clearing, not wanting to go in the forest too. My eyes locked with Larvitars. He seemed to have absolutely no expression. Although it looked as if he was staring me down. Never mind. I ran as fast as I could into the forest. The greenery was nice. The tree's were tall, and in full leaf. The sun shone through some of the branches, and made the forest floor look dappled. I made my way through the forest, trying to pick up Clarys smell... of Kyles, Vulpix's or even Eevee's. I knelled on the ground and crawled on the floor, hiding behind bushes and other shrubs. I couldn't pick up the smell of them, and then I stopped. What if I get lost? If I can't find them? I had already gone for from the forests edge. Where was I? Getting back on my two feet, I scrambled through the forest desperately to find them, or the campsite again. The smells in the air were fresh and watery, not a people or pokemon smell. Then I picked up a scent of human and pokemon, and I ran toward it. I emerged into a small clearing, full of sunlight, and the light stung my eyes. But instead of "Oh look, it's Minun! She found us!" I heard . "Bibarel! Use Hyper fang on Spinda!" I was practically in the middle of the battle. I dodged a Superfang as the Bibarel clamped onto the spinda. It looked like a stupid creature.. Actually, both of them did. The trainers looked kinda stupid too. Matching their pokemon.. The one on the same side as the Spinda pointed outwards and made some epic facial expression, like he was expecting a close up... "Spinda use Copycat!" and then the Spinda started chewing on the Bibarel. They looked like they were eating eachother! Wow... what an awesome battle I was sarcastic, of course. I turned away from the 'battle' and went back into the forest, back to my search. Where could they have gone? I slumped around, kicking little rocks and traveling through the growth. Then i heard little whimpers. I scented the air and... voila! I practically skipped into the little area that they were squished in. Clary, Kyle, Eevee, and Vulpix were there. Kyle was soothing the Eevee and Clary was sitting on a rock, and holding her burn wound. Plz Comment =] & i promise, more is coming soon. We (Clary, Kyle, his Vulpix, Eevee and I) walked back to the 'campsite'. Im not exactly sure how they found it, so i decided to ask. "Mii..?" How do you know where we're going? I asked, and i tugged at Clarys sweater to get her attention. She turned to me, and answered, as if she knew what i was asking..
She laughed and patted my head. "Ah, Minun. If you had only been around for a while longer, you'd have known to follow forest paths" She smiled widely. I wanted to smack my forehead. When we emerged through the trees, we smelled food. Really yummy food, at that. In the 'campsite' There was a crackling fire and a pot over it, suspended by branches. No one was around the fire or the food.. Accept for Larvitar, who stood some good metres away staring at us. Did he make this food? No way..
Kyle "Woah" 'd and Clary started clapping. Why?. Vulpix took to keeping an eye on Eevee, and she walked up to Larvitar. I stood at the edge of the forest listening. "Vulpix vul?" Did you cook all of this, Larvitar? She motioned Eevee to follow her and they went to sit by Kyle. I decided it was time to fill my oh so very empty tummy. I trotted up to Clary and jumped to sit on her lap. He hugged me with one arm and continued to eat her food. I pointed to it, and she laughed. "You can get your own, you know." But she shook her head and gave her piece to me. Mwahaha. So now, we were all just chilling, eating our lunch/ Breakfast (O.o) and sitting around a fire. The sun was almost halfway up the sky, and I thought, maybe that we should start going.. But right before I said anything, Kyle stood up and drowned the fire. "So.. sis. Feeling up to a little battle?" Um.... who would she be sending out? Not ME? Clary looked at her brother and smiled widely, then nodded. "Sure thing, bro-bro" she glanced down at me..
"What do you say, Minun? Not like it matters TOO much.. But if you want to get stronger, you're going to have to battle." I stared at her with blank eyes. I quietly jumped down from her lap, walked up to a tree, and lightly hit my head against it. When I turned around, Clary and her brother were both looking at me with the ODDEST expressions. Vulpix was laughing to herself and Eevee was playing with a rock so it clearly has nothing to go with me. Larvitar, surprisingly, still had those same evilish eyes but was smiling slightly. Dam guy has a twisted sense of humor I thought. I walked to Clary. She said I'd get stronger, right? "Miinuunn" Okay fine. I'll do it Then I smiled to make sure she knew I was okay with it. Kyle clapped and shook his head. "Amazing!" then winked at his sis. Are they mocking me? "Well," Kyle said, "I wont scare you guys by using Larvitar. Plus, he has ground advantage over Electric.... So how about Minun and Vulpix have a nice battle?" Clary looked at me "It seems she gets along best with vulpix. so this would be a nice friendly battle. I should warn you though, brother. For being practically a first born, Minun is quite strong.. " She smiled at Kyle. I was happy she had said that. It gave me a bit more... confidence. I think I like praise. Kyle motioned to Vulpix, and she came to sit beside him, and she looked up at him. "Vulllll" Thanks for choosing me, friend. She says friend alot... oh well. Kyle stood up, and took two pokeballs from his belt. "Larvitar, Eevee, return" A red light flashed out of the pokeballs and and engulfed the two pokemon. They then shot back into their respective pokeballs. Clary and I started to walk with Kyle, to ind a nice clearing. Then Kyle spoke. "Hm... How about I put a little bit of fire under this battle?" Clary stared at him in confusion and I almost copied her expression exactly. Almost. "I have this pokemon... and i was thinking... if you win, you can have it what do you say?" Clary looked at me and I looked back. I thought this as I stared across the open field at him and Vulpix. I looked at Clary as she rummaged through her bag. She pulled something out of it and held it out to me. I just looked at it. "It's a Power Anklet. My mom gave it to me when I was younger.. She said to give it to my pokemon when I wanted to help them become stronger. I want you to take it now." I looked at the Power Anklet and hesitantly took it from her. THIS THING WAYS A TON!! I sat down slowly and shoved it around my ankle. We heard Kyles voice from across the field. "Okay sis, lets get this over and done with. Remember the rules: no healing your pokemon during the battle.. and if you win, I'll give you that pokemon I mentioned." Clary nodded and smiled. She looked to me. "Don't worry, I'll be cheering you on the whole time.. and helping too "
I nodded sadly and walked forward. Slowly. She turned around and we waited for our trainers orders.